Prepare to shop for gemstones and jewellery on your next holiday Going on holiday and fancy buying a piece of jewellery? Are you planning on making a romantic gesture, but your lack of knowledge makes you uneasy about parting with your hard-earned cash? What should you look out for? How do you know it's real? How do you bring it home safely? This handy little guide answers these questions and many more. It's an easy read without any gem jargon, and is packed with useful tips and priceless information that could save you a fortune! Whether you are shopping for an engagement ring or special anniversary gift, or perhaps for a souvenir of your trip, Buying Gemstones and Jewellery Worldwide will guide you through the experience. 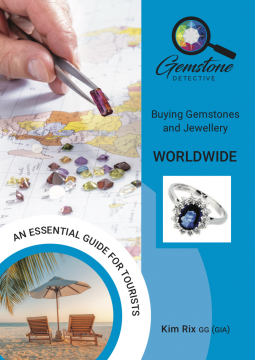 An integral part of the `Gemstone Detective' series, this unique book provides the essential knowledge you need to buy with confidence. Written by Kim Rix, a gemmologist (GIA) and professional photographer who has travelled to over fifty countries in her lifetime. "An interesting book which gives an insight into trading gemstones and what to do and what not to do. Very interesting to read about the history of some of the gemstones and how they became downgraded to semi-precious. I liked the book it was very informative."